The French Navy does not need the Mistral ships that were built for Russia, and with no chance of selling them to a third party, it seems paying the penalty of sinking the vessels could be the cheapest way out of the contract France fails to abide by. “If the question is whether the French naval forces need these Mistrals, the answer is 'no',”Admiral Bernard Rogel, the chief of staff of the French Navy said as cited by Le Monde. The French media reports that since France cannot sell the ships to a third party, the easiest ways out of the embarrassing crisis would be to sink the two brand new vessels. And the cheapest as well, as decommissioning work would cost about €20 million (nearly $23 million) – compared to the estimated €2 to €5 million ($3 to $5.7 million) France wastes monthly on maintaining the ships. After the deal to deliver the helicopter carriers to Russia was indefinitely postponed, the country has no use for the expensive ships, and sources in the French Navy also reportedly agree that it will be best for France to simply sink the ships. “Experts have suggested destroying these helicopter carriers. Of course such decision will not be welcomed by employees of the dock yards who built them, but it will be the cheapest thing to do, costing some €20 million (nearly $23 million),” Le Monde wrote, as cited by TASS. Meanwhile, the French secretary general for defense and national security, Louis Gautier brought Paris’ offer to end the deadlock to Moscow. 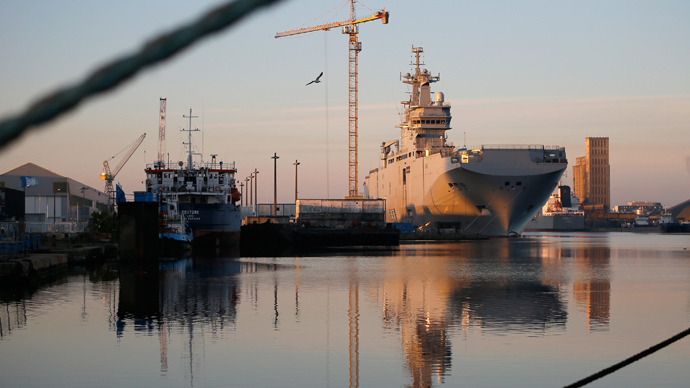 France has reportedly proposed to terminate the Mistral ships contract, offering €100 million ($114 million) less than Moscow paid upfront, not to mention other costs on the project, such as training and new infrastructure. By offering the money back, Paris hopes to get a permission from Russia to sell the helicopter carriers to a third party, sources told Russia’s Kommersant newspaper. Kremlin spokesman Dmitry Peskov has previously said that Moscow would welcome either ships or money. Russian Foreign Minister Sergey Lavrov also commented that the Mistral issue has now become purely legal. The two Mistral class amphibious ships have been the single biggest point of contention between Russia and France since President Francois Hollande blocked the delivery of the vessels. According to the 2011 contract, France agreed to build two helicopter carriers Vladivostok and Sevastopol, with the latter planned for completion in 2015. However, it failed to pass them to the Russian military. Paris and Moscow are continuing to hold consultations over the situation with some “positive” trends being seen, the deputy director from the Russian Federal Service for Military-Technical Cooperation, Anatoly Pinchuk, told Sputnik on Friday.